Now in its 10th year of operation, the initiative places Indigenous students with local employers across a growing range of industries, providing work place skills and valuable work experience, and in some cases, full-time employment. The CRDC funded positions (specifically targeting Indigenous students starting year 11 and 12) are part of a broader AES school based trainee program that aims to strengthen communities by providing pathways for young Indigenous people into the labour force and tertiary education. Natalie Tighe, an AES Account Consultant for the Careers Preparatory Program in the New England region has been working with the CRDC to help coordinate CRDC funded and co-funded trainee positions for 10 years. Natalie’s service area is a particularly large one, stretching from Goondiwindi in Southern Queensland to as far south as Tamworth in New South Wales. Natalie works closely with all Indigenous school based trainees from across the region. “We’ve had quite a bit of success with several of our trainees being retained as full-time employees post HSC with their host employers, but we also make sure to follow up with all students, getting them into recruitment services and finding other opportunities for them,” explains Natalie. Sharon Downes is the Senior Research Scientist at the CSIRO, based at the Australian Cotton Institute in Narrabri in New South Wales. The CSIRO are currently hosting one CRDC co-funded Indigenous trainee, having previously hosted several other Indigenous students who have utilised their traineeship to gain employment or further their tertiary education. Sharon also points out the added benefits of the funding provided by the CRDC in allowing the CSIRO to offer a broader range of training opportunities. From the CRDC’s point of view, funding and co-funding Indigenous traineeships serves to strengthen regional cotton farming communities by creating a skilled labour force for the future. “One of the great things about the cotton industry is that it recognises that people are its most important resource – which is why CRDC invests heavily on behalf of cotton growers and the Government in programs to attract, retain and develop our work- force,” says CRDC Executive Director, Bruce Finney. “We believe this long-standing program is an excellent way to help young Indigenous students gain skills, develop hands-on practical experience, build networks, and, most importantly, open doors for future employment opportunities. “It provides real benefits to both local students and local businesses – a real win/win program that we’re very proud to support,” says Mr Finney. While CRDC funded trainee positions were initially available at Government organisations only, the initiative has since incorporated commercial positions as well, and now provides training opportunities for students in a broad range of business sectors and industries. This year five Indigenous students from the New England region will graduate from school based traineeships. Two of them will begin tertiary study at University and one of the students is staying on with their host employer in fulltime employment. Natalie stresses that even for those students who do not continue with employment at their host trainee employer, their traineeship provides invaluable working experience that paves the way for employment elsewhere. “School based traineeships provide students with an opportunity to build their work etiquette. They’re getting into the habit of working, into the habit of time management, getting to work on time and advising their employers if they’re going to be late. Some of them are coming from welfare dependent families that haven’t worked for two or more generations,” says Natalie. Natalie also points out the wide reaching benefits for business and the broader community in supporting school based trainees. “For the host employer, they’re investing resources in producing quality role models and leaders in the Indigenous community, so they’re also getting a great benefit out of it, and you’ve got the community looking in and they’re seeing Indigenous students willing to learn, giving it a go, dealing with a diversity of people no matter what religion, race, age, all of these things, they’re learning how to do all of that on the job,” says Natalie. As more Indigenous school based trainees graduate each year, Natalie believes the trickle down positive effects for local communities and business will only grow. 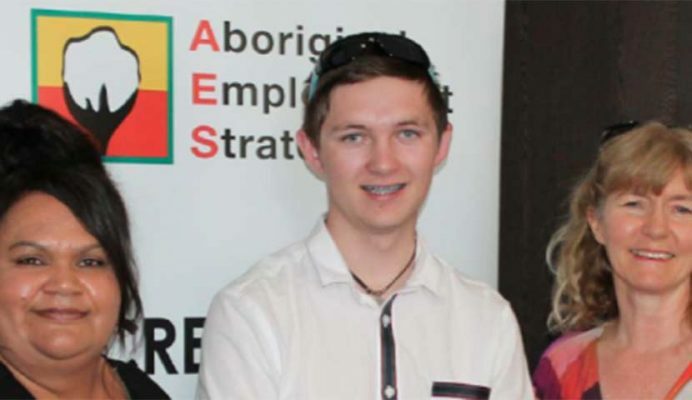 The strong partnership between the AES and the CRDC has been key to creating more employment opportunities for students and in engaging a wider range of business in offering traineeships, providing a major boost for the initiative and employment for young Indigenous people in the region. they’ve grown into mature and sensible young men and women, they’ve gotten so much out of it, they’ve had to overcome a lot of barriers in getting to where they’ve gotten to,” says Natalie.